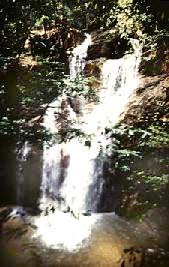 Along the new Karak Expressway, there is a beautiful waterfall just 10 minutes walk from the expressway. This is the Pisang Waterfall. A lay-by is available for stopping or parking at the point of entry, but such practice is discouraged because of the speeding traffic. Instead of the short cut, follow the longer route, a one hour hike through the pristine forest of Gombak. 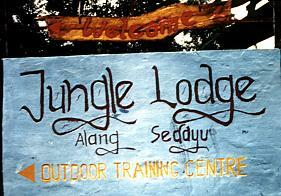 This is the Jungle Lodge training camps at the 11th kilometers Gombak- Genting old road. Pass this center and leave your vehicle at the pump house. 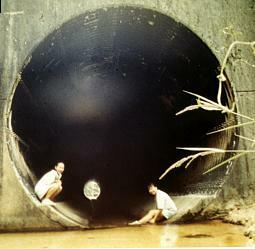 Either you get permission to trespass the pump house or trek upstream to reach this twin tunnels beneath the expressway. This new stream you start trekking along , flows through the most serene jungle. You can trek on either banks, level with clearly marked tracks used by the villagers. The gorge here is broad and the banks are filled with alluvial sands. It is a 30 minutes walk but only for less than a kilometer. This majestic 22 meters vertical drop greets you on arrival. 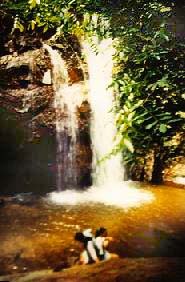 The waterfall also marks the end of the gorge - like a dead end basin. There are tracks to scale this very steep ravine wall and once on top, the place is a clearing for campsites. It is huge place here. One, in front of the waterfall and also another spot behind the waterfall. Further upstream where the 2nd campsite is, the river is going through rapids for the picnickers.